OSWEGO, NY – Oswego Harborfest is pleased to announce that a winning design has been picked for the 2019 festival poster. 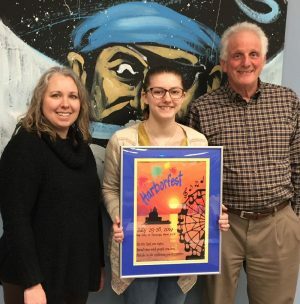 Erin Platten, art teacher; Madison Bouchard, poster contest winner; and Peter Myles, executive director of Oswego Harborfest. The contest entries were collected through December and all entries were carefully deliberated. This year, the festival staff sought a design that depicted many aspects of the festival, such as the fireworks and the music. After much consideration, the team picked the design of Madison Bouchard, a senior at Oswego High School. Bouchard worked under the guidance of art teacher Erin Platten to create the winning design, which best encapsulated the many elements of the festival. She summed up the wonderful excitement that comes with the festival in a few golden words. It will also be copied and framed and given to all Harborfest’s 2019 sponsors and business members. In addition to this, the winning art work may be adapted for use on the 2019 Harborfest T-shirt, program, rack card, etc. as needed. Bouchard also received a prize of $100. entities, individuals and family members. To learn more about the Harborfest posters and merchandise, about Harborfest itself, or to contribute to the support of the event, contact the Harborfest offices at 41 Lake St., Oswego, NY 13126 or visit www.oswegoharborfest.com.